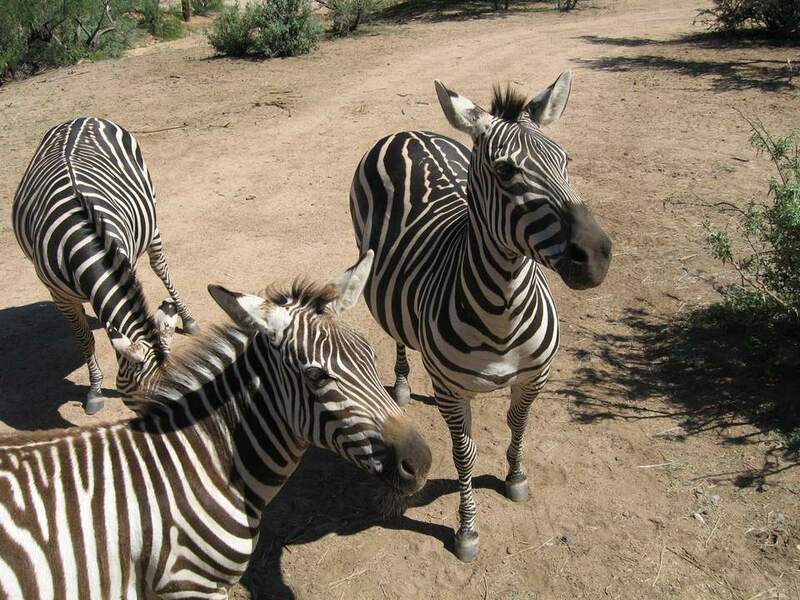 Within about 2 hours from most points in Phoenix, Out of Africa Wildlife Park is located on more than 100 wilderness acres at the base of Mingus Mountain range in Camp Verde, Arizona. The weather and landscape are similar to the Masai Mara region of Kenya and the Serengeti of Tanzania, which suits the inhabitants, bears, tigers, leopards, giraffes, zebra, wolves, deer and more, just fine. The objective here is to provide a natural habitat for the animals while allowing the humans to appreciate and enjoy them. The park is owned and operated by a husband and wife, Dean and Prayeri Harrison. Out of Africa Wildlife Park is not really a zoo. It is a wildlife refuge where people are invited to enjoy the beauty of hundreds of creatures that aren't typically found in the Arizona desert. About half of the animals here are rescues. The individual habitats range in size from about half an acre to 6-1/2 acres. You can easily spend 4 or 5 hours at Out of Africa if you want to take advantage of all the tours and shows on any particular day. Not all shows are available on all days. Check the schedule to see which shows are offered on the day you'll be going. It took a few years after the move to Camp Verde to bring back the Tiger Splash show, and it is the most popular show at the park. The animals are not trained, so you don't really know what you'll see the tigers do. There are plenty of seats at the Tiger Splash Arena, but only a couple of rows in the back are benches with backs. The other seats are basically like sitting on concrete steps. Most of the seating area at Tiger Splash Arena is covered. Because the animals here have large habitats that afford them ample space to move around, play, get shade and hide, there are times when you might not be able to find them. That can be disappointing. Be patient, or come back and try again later in the day. Although Out of Africa is about 2,000 feet higher in elevation than Phoenix and is cooler, keep in mind that in the summer in Camp Verde it is still hot! Take precautions! Out of Africa is suitable for all ages, but understand that there is no traditional petting zoo here. There are opportunities to feed a tiger (extra charge), feed a giraffe or camel, or touch a snake, but that's about it for hands-on activities. Be prepared to walk on dirt paths and uneven surfaces. You can only ride on the African Bush Safari, but you can walk or ride, or a combination of the two in the wildlife preserve. You'll definitely want to do both. If you can only do one, though, I always enjoy wandering through the Wildlife Preserve best, where you'll see the big cats, hyenas, bears and more. The snack bars near Tiger Splash Arena have reasonable prices. Leave the gift shop until the end of your visit so you don't have as much to carry. The gift shop is at the entrance/exit. Out of Africa is a bit rustic. This is not a theme park. Your tour vehicle might not be very glitzy (unless you are on the VIP tour), there are no carnival-type rides, just trams and tour buses. The Unimog Tour is designed for a smaller group of people, minimum 5 years old on a one-hour personal tour through the park, including the African Bush Safari where the animals walk up to the vehicle. Out of Africa Wildlife Park offers a Behind the Scenes VIP Tour as well as a Zipline Tour. Various packages are also offered. Reservations are required, and pricing is different for those experiences. This isn't your grandma's zipline. This is a full, 2-1/2 hour experience with five lines starting on a 75' high platform over the wildlife park. You must be at least 8 years old, between 60 and 250 pounds and in good health. No phones or cameras are permitted. Admission to the park is not included in the price, so if you also want to experience Out of Africa Wildlife Park from the ground you'll need to buy separate tickets for that. No previous zipline experience is necessary. Daytime and night zipline tours are offered. Visit Predator Zip Line online for pricing, more information, and to make reservations. Out of Africa is open seven days per week, 363 days per year, from 9:30 a.m. to 5 p.m. No tickets are sold after 4 p.m. Out of Africa is open on holidays except Thanksgiving and Christmas. Out of Africa used to be just outside of Fountain Hills, but they moved to Camp Verde in 2005. It is located about 90 minutes north of Phoenix. As is common in the industry, the writer was provided with a complimentary visit for review purposes. While it has not influenced this article, About.com believes in full disclosure of all potential conflicts of interest. For more information, see our ethics policy. All prices and offerings mentioned herein are subject to change without notice. Visit the Arizona Capitol Museum. It's Free!